· ORIGINAL "TEXTURED" (CRUDE FINISH) COVER. A locally beloved figure on the Chicago soul scene, Baby Huey never achieved quite the same renown outside of his hometown, despite an exciting live act and a record on Curtis Mayfield's Curtom label. Born James Ramey in Richmond, IN, in 1944, Baby Huey was literally an enormous stage presence: a glandular problem kept his weight around 350-400 pounds and beyond. He began performing in Chicago clubs in 1963 with his backing band the Babysitters and soon became a popular concert draw. As the '60s wore on, Baby Huey's sound moved from energetic R&B into a more psychedelic brand of soul, with a vocal style that drew comparisons to Otis Redding. He signed with Curtom and recorded a debut album, The Baby Huey Story: The Living Legend, that featured several Curtis Mayfield songs (most notably the oft-sampled "Hard Times" and "Mighty Mighty Children"), plus a cover of Sam Cooke's "A Change Is Gonna Come." Sadly, Baby Huey didn't live to see it released; his weight and substance-abuse problems were exacting a steep toll on his body, and on October 28, 1970, he suffered a drug-related heart attack in a hotel room in Chicago. The album was released early the next year, and the Babysitters attempted to carry on for a while with a new lead singer, the still-teenaged Chaka Khan (she would, of course, go on to fame as the frontwoman of funk band Rufus shortly thereafter). 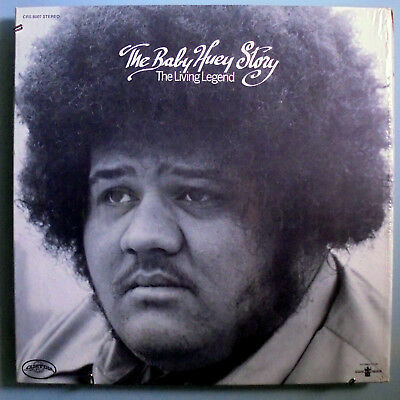 In the years since, Baby Huey's lone LP has become a sought-after collectible among soul fanatics. Baby Huey's only album, released after his untimely death, is titled The Living Legend with good reason. He was legendary in his appearance, a 400-pound man with a penchant for flamboyant clothing and crowned by a woolly Afro, a look that is best illustrated by one of several rare photos included in the Water Records edition that shows our man in a wide-lapeled polka-dot shirt with a lime-green jacket. Beyond his unusual appearance, though, he was graced with a stunning, fierce voice on par with Otis Redding and Howard Tate, wailing and howling one moment and oddly tender and sentimental the next. Nowhere on Living Legend is his range more apparent than the opening track, "Listen to Me," where listeners are introduced to both the enigma of Baby Huey and his diamond-tough psychedelic funk backing band, the Baby Sitters. The high-energy instrumental workout "Mama Get Yourself Together" is worthy of the J.B.'s and a hazy, spiraling ten-minute rendition of Sam Cooke's chestnut "A Change Is Going to Come" confirms that the Baby Sitters could hold their own with Blood, Sweat & Tears. Further lore that catapults The Living Legend from good to great: the production was helmed by Curtis Mayfield, reason enough to make it near essential, and is highlighted by three of his compositions, "Mighty Mighty," which Mayfield and the Impressions recorded a few years earlier; "Running," a classic Mayfield cut that can only be heard here ripped to glorious bits by a band that is trying to let every member solo; and "Hard Times," which Mayfield himself would revisit on his 1975 album There's No Place Like America Today, although Baby Huey's razor-edged reading remains the definitive version -- no small caveat considering Mayfield not only wrote the tune, but could rightfully be considered one of the architects of soul to boot. A quarter century after its release, The Baby Huey Story went on to become a cult classic among soul musicians and hip-hop fans. Its single "Hard Times" in particular has been sampled many times, by artists such as Ice Cube, A Tribe Called Quest, and Ghostface Killah, and was covered by John Legend & The Roots in 2010 for the album Wake Up! (c) The record is pressed on a beautiful, thick, inflexible vinyl, which was usually used for the first or very early pressings. Usually, the sound on such thick vinyl pressings is full-bodied, vivid, and even dramatic. Do not expect to obtain such a majestic analog sound from a digital recording! COVER IS STONE MINT, STILL IN ITS ORIGINAL ►SHRINK WRAP AND NOTHING SHORT OF ABSOLUTE PERFECTION, WITHOUT EVEN A HINT OF A FLAW OR DEFECT; A KIND OF BEAUTY YOU ONLY GET TO SEE ONCE IN A LIFETIME.